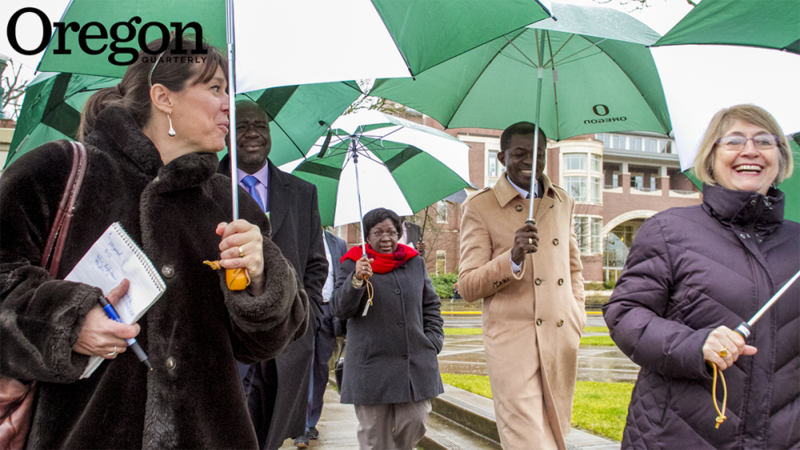 For the fall 2010 issue, Oregon Quarterly received a class note from Eric Benjaminson '81, sharing the news that he had been confirmed as ambassador to the Central African Republic of Gabon and to the Democratic Republic of Sao Tome and Principe. Eric and his wife Paula Benjaminson, a career foreign service officer, would be headed to the region in a few weeks. OQ passed the note to John Manotti, an assistant vice president in the University Development office; he thought it would be of interest to professor of political science Dennis Galvan, codirector of the UO's Global Oregon Initiative and a veteran researcher in West Africa. As it turned out, Manotti was right. Late last year the Gabon-Oregon Transnational Research Center on Environment and Development was established, funded by a $20 million investment from the government of Gabon. The money will be used to set up centers at the UO and in Libreville, Gabon, where researchers from the two countries will work together and collaborate with Gabonese partners in the transition from an oil-based economy to one based on sustainable natural-resource management and ecotourism. The many new partnerships between Gabonese and UO researchers will also contribute to the development of the nation's educational system and support increased entrepreneurial endeavor. The UO is a natural choice for this partnership, according to Gabon's president Ali Bongo Ondimba. "The University of Oregon is a leader in the fields of natural resources management, sustainable development, green technology and architecture, and urban planning—the foundations on which we aspire to build in Gabon," he said during the signing ceremony in Washington, D.C., last June. A country of just 1.6 million people, Gabon has been living off income from its enormous reserves of oil since gaining independence from France in 1960 (current annual oil revenues amount to $14 billion). But the oil is expected to run out within 20 to 30 years. "They need to diversify," Benjaminson says. "It is not a healthy economy in the long term." Fortunately, oil is not Gabon's only resource. Eighty percent of the country is covered with relatively pristine rainforest, and there are also rich deposits of minerals. "The forest is a smaller version of the Amazon forest—the way it used to be," Benjaminson says. "They also have wonderful marine and riverine environments, and good offshore fisheries." Effectively managing these resources is a challenge. While Gabon has the world's largest population of forest elephants, for example, their numbers have declined dramatically due to poaching for ivory. Similarly, the rainforest is also under pressure from logging and agriculture. The Gabonese government has pledged to work on a host of issues, including sustainability, climate change, education and housing reform, land use, and infrastructure such as roads, sanitation, and telecommunications. "This is the Camelot period in Gabon," Galvan says. "They have a relatively young president who has a small group of close, young advisors around him who are the country's best and brightest." In 2003, then-president Omar Bongo Ondimba (Ali Bongo Ondimba's father) put more than one-tenth of the country's landmass into 13 national parks. Gabon now has the most protected rainforest of any African nation, Galvan says, but the parks are fairly inaccessible due to limited roads and lodging. Park management is complicated by the fact that many Gabonese have traditionally hunted and gathered in those areas. "We need to consider the needs of conservation alongside the needs of people facing poverty," Galvan says. Collaboration will be a key element in devising, refining, and carrying out research projects. "Every project will have Gabonese partners," Galvan says. "If I come up with a research topic, my topic will change as it gets infused with the Gabonese sense of what a good research project is and how to go about doing it." Enhancing Gabon's education system is also a strong component of the program. The country's only university has an extremely limited PhD program and is "underresourced," Benjaminson says. UO professors will have the opportunity to create partnerships with professors in Gabon and train students who can then come to the UO for graduate study, he says. At the same time, all of the center's activities will include community outreach, turning research into lessons for primary school kids, with special emphasis on girls and women. 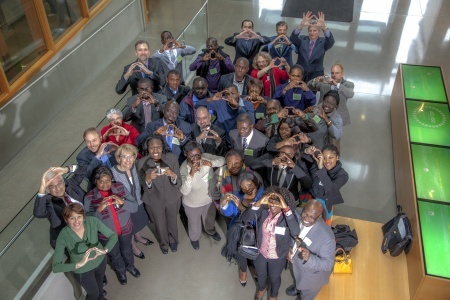 While the UO will lead the program, a number of other Oregon campuses will also be members of the Oregon African Studies Consortium, including Oregon State University, Oregon Health & Science University, Portland State University, and Willamette University. Possible areas of research include everything from forestry and environmental studies to ethnobotany and parasite-destroying drugs to antipoaching initiatives and economic modeling. "Across all the campuses, we have many types of expertise," Galvan says. Brendan Bohannan is one of several UO professors looking forward to collaborative research in Gabon. "We hope to help broaden their economy by working together to include low-impact ecotourism, sustainable use of the forest, and bioprospecting," he says. Bohannan, a professor of biology and director of the UO's Institute of Ecology and Evolution, has been studying the effects of deforestation on microbial biodiversity in the Amazon Basin for many years. Tiny forms of life such as bacteria and fungi have extremely important biological functions. "The vast majority of bacteria don't cause disease," he says. "Many are necessary to our health." Besides working with the Gabonese on issues of rainforest management, Bohannan also sees potential in rainforest bioprospecting—looking for novel organic compounds that could have medical applications. "We hope to establish a long-term research site and exchange students between the two countries," Bohannan says. "UO students could train in Gabon and better understand the rainforest, and Gabonese students would have the opportunity to come here and be trained in the environmental sciences." Seven Gabonese students are already attending the UO. Gleen Landangoye is majoring in business administration, with a focus on green business and tourism. He plans to put his studies to use at home in Gabon. "We've been counting on the forest for our economy," he says, "but we have never known that we should protect the forest as well as use it. The whole point is to learn to use our country's resources more wisely." Galvan couldn't agree more. "Hopefully this collaboration can produce a whole generation who think like Gleen," he says. Of the $20 million Gabon has invested, $5 million will cover setup costs for the program, including creating the centers at the UO and in Gabon. The remaining $15 million endowment will be managed by the UO Foundation, with distributions from the fund financing operations and research at the two centers. "Resources will be pumped into both sides of the relationship," Galvan says, "and we'll have the opportunity to learn from each other. I'm excited about this opportunity."